Small donabe pots are very versatile. You can use it for single (or 2)-serving one pot meal, or use it for making a small "okazu" or tapas-style dish. 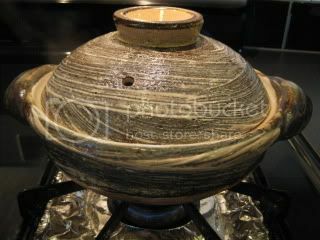 I often use 2 or 3 mini donabe pots to cook and serve different dishes on just a normal day for a balanced meal. Or, they are great for entertaining guets, too. 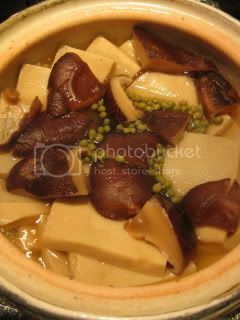 With my mini donabe, "Hakeme", I made shojin-style (Buddhist-style vegan) braised koya tofu and shiitake mushrooms. 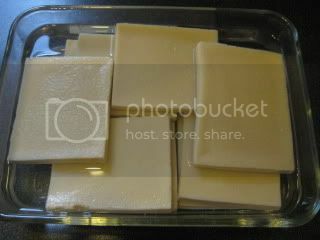 Two main ingredients, Koya Tofu and Dried Shiitake Mushrooms are both dry ingredients, which you can store in your pantry. 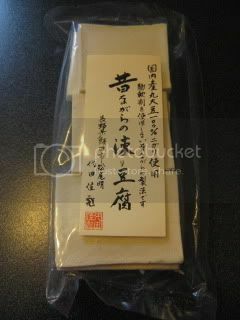 Koya Tofu is a traditional Japanese ingredient. 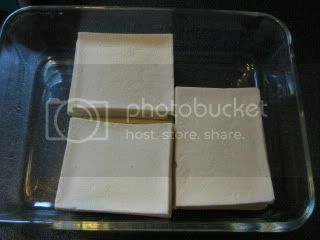 It's a freeze-dry tofu and also considered as a great health food, as it's packed with protein, minerals, etc. You can just rehydrate it in hot water (5-10 minutes). Then, press out the excess moisture and cut into desired size pieces. Dry shiitake mushrooms were also rehydrated in (cold) water for about 30 minutes. In the donabe, I combined 3 cups dashi stock (kombu + dry shiitake base), 2T sake, 2T mirin, 1T sugar, and 1.5T usukuchi shoyu (light-color soy sauce), and added rehydrated koya tofu (8-10 pieces, then each was cut in half) and shiitake (stems removed and quartered). 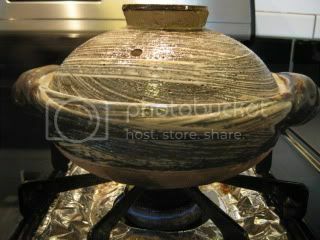 The surface was lined with a piece of foil and covered with a lid, then the donabe was put over medium-heat. Once it starts boiling, the heat was reduced to simmer. After about 30 minutes, the broth was reduced by almost half. I added about 1tsp sansho berries (optional) as a last touch, then turned off the heat. It was let rest for about 15 minutes before serving. 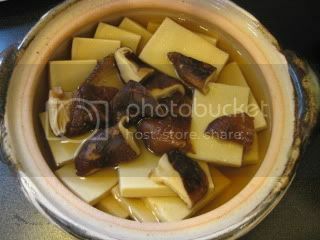 Both the koya tofu and shiitake soaked so much broth and they became so juicy and also meaty. It's such a brilliant dish which can be prepared so easily. I like it hot, warm, or even cold.